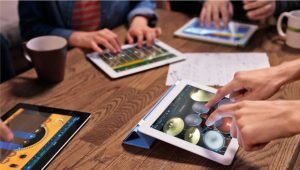 If you are an MOE Teacher / Music In Charge who desires to teach Digital Music (Apple iPad) to your pupils, Do Contact Us today! Music Producing doesn’t get any easier than this. With the very user friendly software, Apple iPad’s Garageband permits you to form your own music creations like a pro. While we encourage students to bring their own headphones, we also provide earpieces so that each pupil can give his full focus into his own music.. Depending on your preference, we could have your students work in pairs or as individuals. Create powerful drum beats with kicks, snares, hi hats, and cymbals. Compose an impressive bass line with Smart Bass. And if your students have the skills, they shall be allowed to move to the next level, melody composition! Learning to record, mix and master your musical piece can’t get easier than this. Create powerful music – at your finger tips. Contact Advent Music today! Trying to find other music programmes instead? Click here.